Thrilled to read AudioFile magazine’s lovely review of Dreamscape’s audiobook production of Elizabeth Warren: Nevertheless She Persisted. I agree: Amy Rubinate's voice work is engaging, the sound effects appealing, and the music choices both graceful and uplifting. Thanks to all! The fabulous A Mighty Girl website—the world's largest collection of books, toys, and movies for smart, confident, and courageous girls—is giving away signed copies of Elizabeth Warren: Nevertheless, She Persisted—enter here! Wonderful way to celebrate the book's b-day tomorrow! Thanks so much, A Mighty Girl! 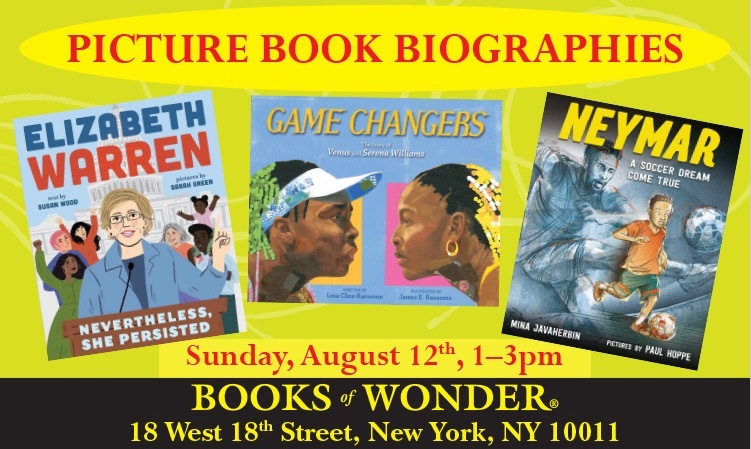 If you'll be in NYC on August 12, hope you'll stop by the fabulous Books of Wonder downtown, where I'll be joining fellow author Lesa Cline-Ransome and illustrators James E. Ransome and Paul Hoppe to chat about picture book biographies, and to sign a bunch, including Elizabeth Warren: Nevertheless, She Persisted!! Excited to be in such esteemed company! !